Oma Tuna is Pacific Bluefin tuna (kuro-maguro or hon-maguro in Japanese), and it is also known as “black diamonds.” Tuna caught in the Tsugaru Strait is wild bluefin tuna. Specifically, tuna caught here in Oma is top quality, and is known across the country by the brand name “Oma Tuna (Oma Maguro in Japanese).” In 2007, Oma Tuna was made into a regional collective trademark, a product of the Oma Fisheries Cooperative. Every tuna shipped out of Oma that weighs over 30km proudly displays on its cheek an Oma Tuna seal to represent the brand. The stickers are tightly managed, with a serial number indicating which boat caught the tuna, when the tuna was caught, and the method used to catch it. 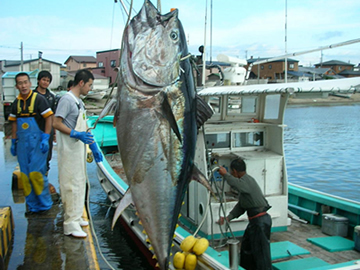 Tuna caught in Oma weigh around 100kg on average. They normally swim around in the sea at around 40km/h, reaching speeds of up to 120km/h to 130km/h when threatened. In 1994, Oma fishermen caught a particularly large tuna weighing 440kg, and it was used as a model for the Tuna Pole Fishing Monument at Cape Oma. The origin of the high prices Oma Tuna earns at Tsukiji Market was the first auction of 2001. The previous year, NHK broadcast a successful TV drama featuring the daughter of an Oma Tuna fisherman as the main character. 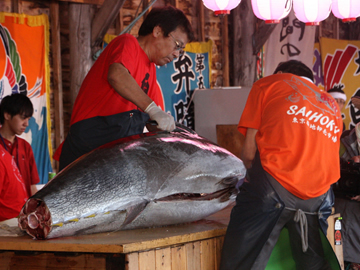 A single tuna from Oma was sold for the high price 20.2 million yen. Since then, the first auction of each year has continued to achieve high prices, with 2013 seeing the astounding auction sale of one Oma Tuna for 155.4 million yen. This sale was recorded as a Guinness World Record for the most expensive tuna sold at an auction. Oma is still catching valuable tuna; in 2019, another Oma Tuna was sold for 333.6 million yen! Oma Tuna is caught in an area of open sea located 5km off the coast of Cape Oma. This area is said to have a geographical indentation that is a path frequented by tuna. Oma faces the Tsugaru Strait, the channel joining the Japan Sea with the Pacific Ocean. Three currents converge at this point: the Kuroshio Current, Tsushima Current, and Chishima Current. As a result, a lot of plankton live in the area. This high-quality plankton feeds squid Pacific saury, which are the tuna’s favorite food. This attracts tuna to the area. Every year from August to January, the tuna that swim around the Japanese islands come to the Tsugaru Strait from both the Japan Sea and the Pacific Ocean. The temperatures in the strait are extremely cold during the fall and winter months so the tuna that can be caught there are top-class tuna that are particularly large, carrying high quality fat all over their bodies. Tuna pole fishing is traditional fishing method that has been practiced for over 100 years. It is a truly astonishing fishing method that uses fishing lines about 2mm in diameter to catch enormous tuna. In the sea around Oma, pole fishing is carried out in the daytime, and a separate fishing method called longline fishing is performed at nighttime. Both methods differ from net fishing and other methods used to capture large numbers of fish at once. The line fishing methods allow for capture of tuna without injuring them so the tuna are in good condition when being drained of blood and preserved, keeping the tuna very fresh as they await shipment. In recent years, some fishermen have begun to use electric shockers to temporarily stun tuna as they are reeled in close to the boats. They can then haul the motionless fish on board. This technique reduces the number of tuna that are lost, as many struggle so hard on the fishing line that they manage to escape, and it allows fishermen to ship out tuna while maximizing the value of each one, preserving the natural resource that is Oma Tuna. Oma is located on Shimokita Peninsula and is the northernmost point of Honshu Island. It faces the Tsugaru Strait, and on a clear day, you can enjoy beautiful views of the mountain ranges of Hokkaido, all the way from Mt. Hakone to Cape Esan. Oma is a 90 minute ferry ride from Hakodate City in Hokkaido. 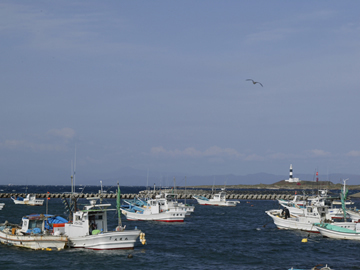 As a town right on the Tsugaru Strait (called “the sea of treasure”), since long ago Oma has been a town of first-class fishermen supported by the blessings of the sea. Oma Tuna has gained popularity since 2001’s record setting sale of 20.2 million yen for a single tuna at the first auction of the year at Tsukiji Market, but tuna fishermen have also gained recognition in their attempts to catch tuna. In recent years, fishermen have gone beyond the sea to reach out to the rest of the world, by setting off to Spain and Hawaii to battle against local fishermen in television programs, or by inviting foreign visitors onto their boats to allow them to watch their tuna pole-and-line fishing in action. As a response, tuna fishermen have come forward to the media to talk about their lives and the risks they take on the tuna. Many documentaries about this way of life have been broadcast across Japan. This fame has reached the point that people visit Oma because they want to meet the fishermen who appeared on television. In recent years, Oma’s fisherman have begun to expand their influence beyond out seas, traveling to places like Hawaii and Spain to compete against local fisherman in television programs, and allowing foreign visitors onto their boats to watch tuna pole fishing in action. Copyright © Oma Wide Up!